$30 for a 30 degree thermometer! Measure temperatures from a distance! Just aim, press the button and read the temperature on the backlit LCD screen. 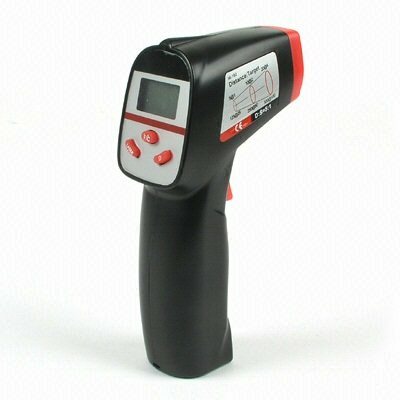 Safely check the temperature of anything from 0 to 400 degF (-20 to 200 degC) in less than 1 second. 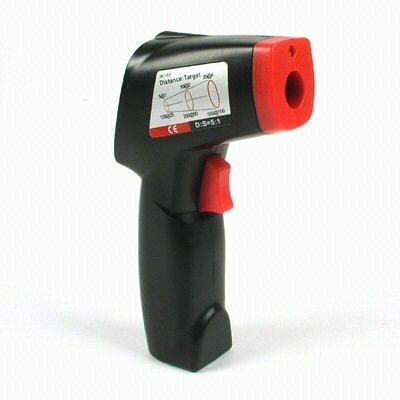 A built-in laser beam can be set to automatically turn on when you are measuring temperatures so that you can see exactly what the gun is measuring. A narrow 30 degree beam size helps you be selective from a distance. Compact and easy to use. Just point and press the button! 5:1 distance to spot measurement. From 5 inches away, unit will measure a 1 inch spot. From 10 inches, unit will measure a 2 inch spot, etc. Measure around windows and doors to detect energy loss. Save money by finding heat and cooling losses. Check oven, stove or barbecue temperatures without touch. Test foods for temperature quickly and safely. Diagnose heating and air conditioning vents, heaters and more. 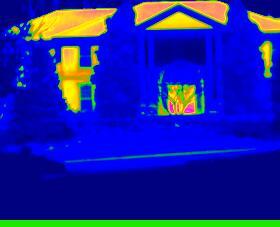 The picture below is a thermal image taken by one of our thermal cameras. You can see the heat leaks from the roof, windows and doors. You can use the 30/30 to find the heat losses as well, spending only $30.00 instead of over $10,000.00!